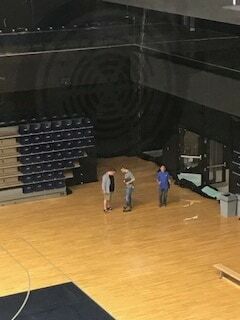 The lower levels of the Goldring Centre for High Performance Sport flooded after a pipe burst at approximately 8:00 pm on May 28. According to Goldring employees at the scene, the ceiling on the first floor is partially collapsed. The basketball court in the basement of Goldring Centre is covered in water, which continued to gush onto the floor hours after the initial burst due to a few exposed areas in the wall shared with the first floor. According the Faculty of Kinesiology and Physical Education’s website, the second, third, and fourth floors are expected to be operational by 7:00 am on May 30. These floors include the Strength and Conditioning Centre, Fitness Studio, second-floor change rooms, offices, labs, and the David L. MacIntosh Sport Medicine Clinic. According to Goldring employees, the water pressure was significant enough to set off the facility’s fire alarm, and witnesses stated that at least four Toronto Fire trucks were called to the scene. The pipe appears to have broken in the ceiling between the first and second floors of the facility, pouring water into the lower two floors and onto the basement’s basketball court. The top two tiers of Goldring Centre, including the main areas where Varsity athletes train, were not impacted by the flooding. One Goldring employee said there would be significant damage to the court’s surface if the water continued to sit. Night workers at Goldring arrived to find their workplace flooded, and were not informed when they would be able to return to work. Editor’s Note (May 29): The article has been updated to include when upper levels of the building are expected to re-open.